"I did foundation maths and now I'm in university"
Thomas learned there were other pathways to college, and that it didn't all come down to Leaving Cert grades and points. He applied for a post-Leaving Certificate (PLC) course in business at Coláiste Íde, Finglas. There were eight modules in the PLC and Thomas was "aiming to achieve eight distinctions in order to stand a chance of getting into DCU." 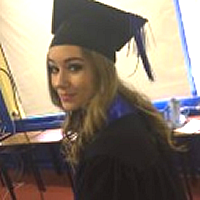 Two years on, the 20-year-old from Finglas, Dublin is entering second year in Dublin City University (DCU). Click here to read full article on the independent.ie website. "PLCs are a great way of getting prepared for what college is like and getting one-to-one help in small classes. It changed my life for the better and I wish I could go back to Colaiste Íde where I did mine." Sadb Molloy from (19) is a student from Co Meath who got under 200 points in her Leaving Cert and now has the equivalent of 400 points through her completed PLC and will now go onto study in UCD this year. Click here to read full article on the journal.ie website. "It's the best decision I've ever taken," says Shauna. The Accounting Technicians Ireland (ATI) Apprenticeship is a work-based learning programme in which apprentices are paid at least €18,000 a year. The programme is open to both school-leavers and mature students. This is one of the modern era, white-collar apprenticeships offering new career routes to students who prefer an approach that blends paid, practical work with study, leading to qualifications up to degree level, or even above. Shauna began her apprenticeship with MBM Chartered Accountants, Clonee, Co Meath and loves the mix of working and learning simultaneously. Click here to view the range of options in the School of Business, Tourism & Computing.